Take family, friends, or just that special person out for a fun picnic. Your favorite picnic foods and the Picnic Bacpack are all you’ll need for a great time. 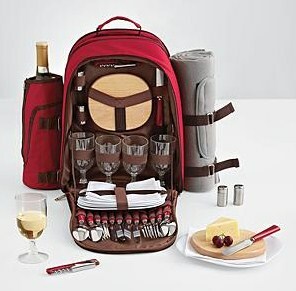 This easy-carry backpack comes with plates, goblets, flatware and napkins for four. Also included are a wooden cutting board, salt/pepper shakers, a bread knife, a sommelier’s corkscrew, a sable-gray felt blanket, and a detachable wine cooler.